A unique and delicious interpretation of the Australian classic, this pinot noir-led sparkling red wine is a great companion to food and friends. The nose offers an array of dark berry fruit aromas, from ripe cherries, blackberries and blackcurrants through to sweet blueberries. Sweet spice notes of liquorice, cinnamon and cloves echo throughout the full, rich, and mouth-filling palate. The bubbles from the prise de mousse add softness and weight to the middle palate with fine chalky tannins contributing structure and length, and a bright, persistent and savoury finish. The grapes for the Sparkling Pinot Shiraz were sourced from a diverse range of cool climate viticultural sites within Victoria. Pinot noir, which makes up approximately 70% of the blend, was sourced from the Green Point vineyard in the Yarra Valley, as well as our vineyard in Strathbogie. Dedicated growers in the premium cool climate regions of Victoria, including Heathcote, Yarra Valley, and the Pyrenees, supplied shiraz that provides structure and fine tannins to the final blend. Vineyards are planted to varying densities depending on the soil type, with an average yield of 10-12 tonnes per hectare. Most of the selected vineyards are trained to the standard vertical shoot positioning trellis to optimise flavour and tannin development. Grapes were picked between March and May at 12.5° - 13° baumé. The grapes from each vineyard were crushed and fermented separately in open top fermenters, to preserve their unique characteristics. The grapes were gently punched down by hand up to six times a day, to extract the colour from the skins. Once initial fermentation was complete the wine was racked to stainless steel tanks to undergo malolactic fermentation with some batches being stored in seasoned oak barrels for just a few months in order to ensure the retention of the fresh varietal flavours and a soft, smooth tannin structure. The final blend was composed of approximately 70% pinot noir and 30% shiraz assembled from about 15 individual red wine cuvées from the current vintage and a small amount of one to two year old reserve wines. Like all of our sparkling wine styles, the second fermentation took place in bottle with a specially selected yeast strain. 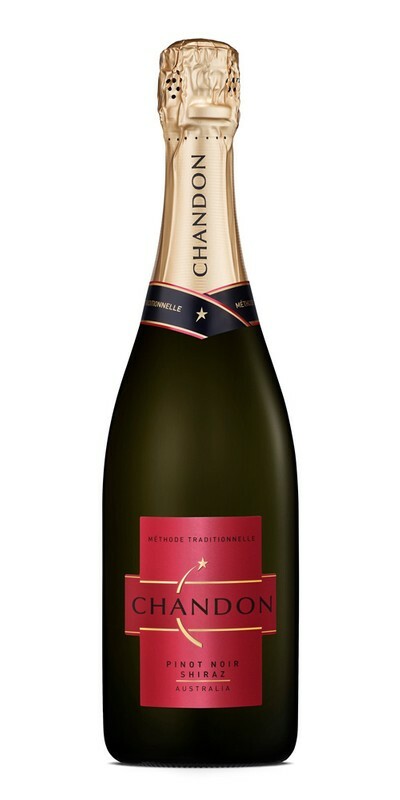 The Chandon Sparkling Pinot Shiraz is a forward and fruit driven style and received only 12 to 18 months of yeast ageing, after which it was disgorged. A final dosage was then added to fine tune the structure and balance of the wine and the bottles sealed under cork and aged in bottle for a minimum of three months before release.